The HTC One is a smarphone that has been built with one purpose, to revive the ailing fortunes of its maker by being not only the best Android smartphone out right now, but also by remaining the best handset in months to come (Samsung Galaxy S4 we're looking at you). To even stand a chance of doing this it'll need to be as fast as the Google Nexus 4, as beautiful to look at as the Sony Xperia Z and then also boast the kind of feature set that we've now seen from the Samsung Galaxy S4. This then all has to be wrapped up in a Full HD package that won't weigh a tonne but still boasts a build quality that would make the iPhone bow its head in shame. No pressure then. Well to start off with the iPhone 5 can start blushing because in terms of build quality the HTC One is almost flawless. A precision machined aluminium body is then seamlessly joined to the rest of the phone using a technique which leaves no gaps, and we mean none at all. It's certainly on a par with Apple's own standards and even though we've only had a short time with the S4 we're going to go ahead and say that its got that safely beat. All that aluminium must surely translate into weight then? Well at 143g it's not the lightest smartphone being safely trumped by both the BlackBerry Z10 and the Galaxy S4. That said it never becomes noticeable instead giving the feeling of being sturdy. This is then carried across with the 137.4 x 68.2 x 9.3mm dimensions which put it as being just slightly thicker than the iPhone 5. On the top you'll find the power/lock button and on the side is the volume rocker, which, from a design point- of-view is the weakest aspect of the phone. On the front you'll notice two rectangular grills which is where HTC has managed to cram two speakers for stereo sound. The One comes with an almost unrecognisable Android 4.1.2 thanks to HTC's latest version of its Sense UI. Whereas with the HTC One X you could still see hints that there was Google's operating system lurking underneath the One has almost entirely ditched all of this for a cleaner experience that offers less hassle. The most notable addition is BlinkFeed, a news aggregator that can be customised using your social networks and by adding a number of compatible news sources. In principle it's a brilliant idea however we found that day to day it's just not customisable enough and with only pre-approved news sources available it never truly feels like a rival for Flipboard. This could of course change over time as more are added but for now it's just not the revelation we were expecting, something that's made even more disappointing when you realise that it's permanently placed as one of your homescreens. 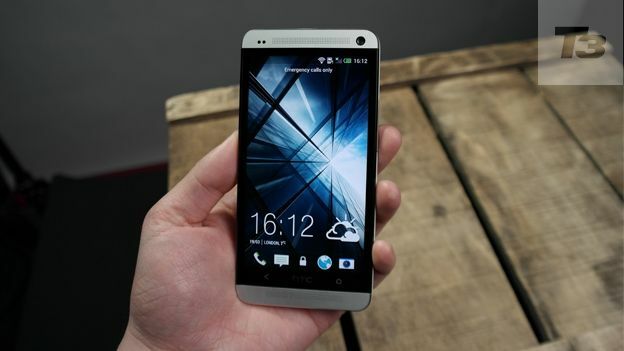 The HTC One comes with a 4.7-inch 1080p Full HD display sporting a ludicrous 468ppi. When you first look at it the effect is actually underwhelming thanks to the large black expanse of an, as yet, unused BlinkFeed, however take a few pictures or head over to YouTube and you'll soon realise the error of your judgement. It's a stunning panel that produces dazzling levels of contrast and colour reproduction and while we know the current trend is to go bigger, we'd argue that HTC has absolutely nailed it with this 4.7-inch offering. The HTC One sports a 4MP Ultrapixel camera. Yes you saw correctly, Ultrapixel - not Megapixel. All camera sensors are broken up into tiny photosites, each photosite then translates into one pixel so while the HTC One has less of these than most of its rivals, it's actually still taking up the same amount of physical space because the photosites are much bigger. This means it can collect a lot more light and then in turn produce much better looking photos. While the Ultrapixel story may prove a tad confusing for buyers, thankfully the theory does translate into real life with the One producing some of the best images we've seen from a smartphone camera, so much so that we'd place it in the same league as the Nokia PureView 808. Its ability to capture low light images is exceptional while colour reproduction is outstanding. Along with the Ultrapixel camera is HTC Zoe, a new feature which takes 20 images whilst also recording a short three second video clip. The advantage of this is that not only do you have a short clip (known as a 'Zoe') for social networks but you can also drag through the video and pick a picture if you'd rather just send a still. It's unlikely that you're going to be using the Zoe mode on a day to day basis, but that's not to say it's no good. It works really well but if you're going to send a video it'll probably be longer than three seconds and if you wanted to take a picture you'd probably either do it separately or find an app that lets you take a picture while you're recording. Under the hood you'll find a 1.7GHz quad-core processor along with 2GB of RAM, which combined makes the HTC One one of the fastest smartphones on the planet. While we would question the need for such an overt amount of power it certainly means that navigating the One is absolutely seamless with no lag whatsoever when gaming, playing video or through heavy multi-tasking. One thing we will note is that the One did get quite hot when downloading large apps from Google Play or when playing a high-resolution game like Real Racing. While it certainly isn't as bad as the Xperia Z it definitely seems to be a trend that is appearing as smartphones get more and more processing grunt. While HTC hasn't provided an official battery life for the HTC One what we have learnt is that the experience can be wildly differing. We've had some comments complaining that the battery life is woefully bad whilst others describe it as on par. In fact we'd differ with all of these and say that it's actually not bad at all. If you're going to spend your day mainly texting, tweeting and browsing then you'll get a comfortable day's usage with the One finally beginning to complain by the late evening. If however your commute is filled with Real Racing, heavy data usage and a serious dose of YouTube then we'd probably recommend having a charger at work. The HTC One has placed Samsung in a unique position. When the Samsung Galaxy S3 came out it simply became the best Android smartphone available making it the only true rival to Apple's iPhone by default. With the Galaxy S4 however things have changed, HTC has been suffering from declining sales and in order to regain a fraction of its lost market share the company needed to not only create the best phone it has ever made but also the best Android phone. So while Samsung's upcoming sequel may appear to be a veritable powerhouse we can confidently say that the HTC One is the best Android smartphone you can buy right now. Read our round up of the best Android phones.